If you are in the New York Area, MOMA has a great new exhibit. A group of sisters have taken a photo every year for the past forty years in the same order. In addition to be a fascinating art project, it’s a wonderful family heirloom. It started as a family photograph. It blossomed into an annual rite of passage. This entry was posted in Event and tagged Brown sister, MOMA, Nicholas Nixon, photography. Bookmark the permalink. Tuesday night, Zocalo Public Square hosted a conversation lead by Annalee Newiz with Lawrence Krauss and Neal Stephenson regarding science, science fiction and optimism. While the evening was a “light” discussion of these topics, it was a fascinating evening. The important takeaways for me are science and technology are not the same thing. People, including me, always think of the two as one in the same but the goals of science are not necessarily the pushing technology forward. Science is a very creative field were the ideas or sometimes more important than the outcomes. In Krauss’ opinion. Science is far more imaginative than science fiction. The human mind cannot reach the endless potential of reality. I’m not sure if I agree with the last point. We know so little about the human brain that there is no to quantify its potential. Luckily for us Zocalo records its events. And post them online. Please enjoy the lively conversation at the link below. Zócalo Public Square :: Video Archive. This entry was posted in Event and tagged Analee Newitz, Hieroglyph, IO9, Lawrence Krauss, MOCA, Neal Stephenson, Zocalo Public Square. Bookmark the permalink. I am fortunate to live in the LA area where a lot of diverse events occur every day of the week. Tonight, there is a discussion on whether Science Fiction Revolutionize Science with Neal Stephenson and Lawrence Krauss at MOCA. Check back tomorrow for my recap of the event. Science fiction shares with science a most important driver: a fascination with the possibilities of existence. As a theoretical physicist, my motivation for studying the universe has always been the wonder of what might be possible rather than what is practical. This makes me particularly sympathetic to the challenges facing science fiction writers. After all, perhaps the most significant difference between science and science fiction is that the former explores what is possible in our universe, and the latter what might be possible in any universe. This entry was posted in Event and tagged Hieroglyph, Lawrence Krauss, MOCA, Neal Stephenson, Zocalo Public Square. Bookmark the permalink. In advance of the release of “Lucy” by Luc Besson on July 25, American Cinematheque is screening some of his better known works. Leading up to a special screening of Lucy with a Q&A afterwards with Luc Besson. Check out Cherry Davis interview with Luc Besson at Wondercon 2014. For more information, check out the American Cinematheque. This entry was posted in Event and tagged American Cinematheque, Anna Parillaud, Bruce Willis, Cherry Davis, Christopher Lambert, Gary Oldman, Ian Holm, Isabelle Adjani, Jean Reno, Luc Besson, Mila Jovovich, Natalie Portman. Bookmark the permalink. 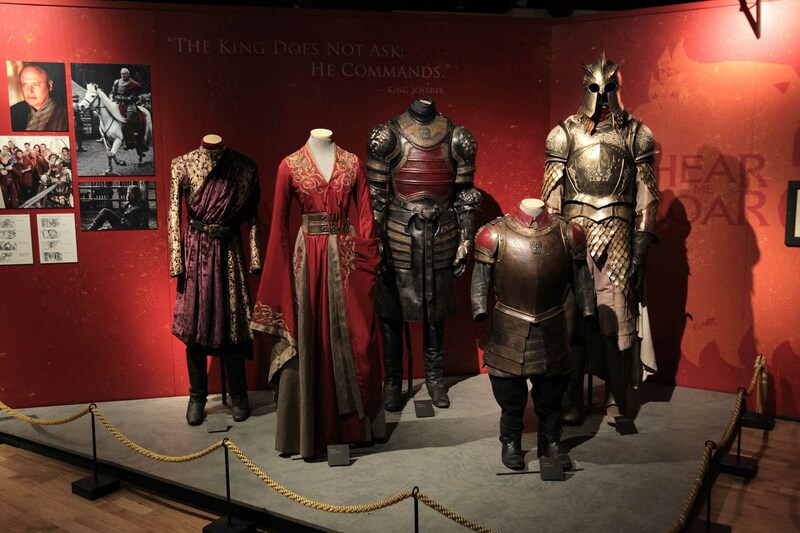 From The Wizard of Oz and The Princess Bride to Harry Potter and Snow White and the Huntsman, Fantasy: Worlds of Myth and Magic invites audiences on a fantastical journey to unearth the inspiration behind this genre’s most magnificent creations. For years, I have wanted to see Shen Yun. The dance troupe travels constantly and always performs in the LA area during the beginning of the year. I am a fan of Classical Chinese music and dance. The dancers always seem so otherworldly with their grace and movements which are so unlike Euro- American ones that I am accustomed to. Last Saturday, I splurged and purchased an orchestra seat and sat down waiting to be captivated for two hours. Let me tell you, I was EXTREMELY disappointed in the production. I’m a traditional kind of nerd and if I going to see a dance performance, I like the performers to just dance. The dance itself should speak for itself. 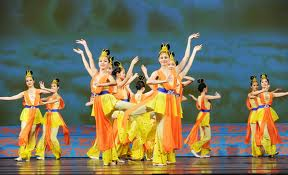 China is an ethnically diverse and the show include many folk dances from the Qiang, Mongolian, Hmong and other dances from across the region. All I can say is do your research before you purchase tickets to me. I generally say “oh this looks good lets check it out.” With the philosophy I’ve seen a lot of great shows with the occasion clunker in there. Shen Yun was definitely a clunker. This entry was posted in Event, Reviews and tagged Classical Chinese Dance, Shen Yun. Bookmark the permalink. Do you have some free time over the next 11 weeks? Then I’ve found a great project for you! The University of Michigan is offering the following great course. This entry was posted in Event and tagged Carroll, Grimm, MOOC, Sci Fi and Fantasy lectures, Stroker. Bookmark the permalink. Can’t wait! Went to the taping of the show over the summer. Excited to see the final result. This entry was posted in Event and tagged HitRECord, Joseph Gordon-Levitt, Pivot TV, Variety show. Bookmark the permalink. 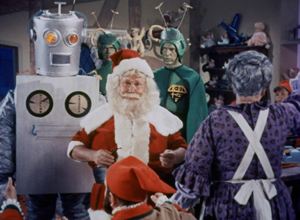 … and catch “Santa Claus Conquers The Martians” this Thursday, December 5, in theaters across the country. The stars of RiffTrax – Michael J. Nelson, Kevin Murphy and Bill Corbett are back and ready to elevate this film with their classic snark. This entry was posted in Event and tagged Christmas Movies, Fantasy, Fathom, Mystery Science Theater 3000, RiffTrax, Santa Conquers the Martians, Sci Fi Movies. Bookmark the permalink.